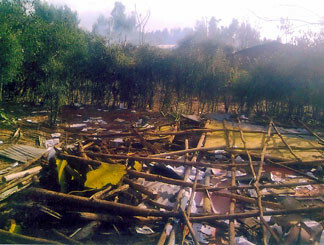 Remains of one of the churches destroyed during the Muslim rampage. Moreover, the dubious excuse used to justify this latest barbarous outburst—"desecration of the Koran"—is a reminder of the double-standards Bibles suffer in the Islamic world, where they are routinely confiscated and burned. Indeed, even as Muslim Ethiopians were rampaging, Muslim nations hailed as being "moderate"—Malaysia and Bangladesh—also made headlines last week with their deplorable treatment of Christians and Bibles. Worse, the West helps standardize such a biased approach: the U.S. government—Obama, Hillary, and any number of other grandstanding politicians—rose up in condemnation when a virtually anonymous, small-town pastor threatened to burn the Koran, while saying nary a word about the countless Bibles daily mutilated in the Muslim world (a 2003 fatwa that ruled the Bible suitable for use by Muslims when cleaning after defecation went largely unnoticed). Such a gutless approach is not surprising considering the sort of people who advise the military, such as Lt. Cmdr. Youssef Aboul-Enein, who recommends that, if ever an American soldier desecrates a Koran, U.S. leadership must offer "unconditional apologies," and emulate the words of Maj. Gen. Jeffrey Hammond: "I come before you [Muslims] seeking your forgiveness, in the most humble manner I look in your eyes today, and say please forgive me and my soldiers," followed by abjectly kissing a new Koran (Militant Islamist Ideology, p. 26). As Jonathan Racho, an official at International Christian Concern, said, "It's extremely disconcerting that in Ethiopia, where Christians are the majority, they are also the victims of persecution." This oddity is explained by Prime Minister Meles Zenawi's assertion that Ethiopian Islamists "have changed their tactics and they have been able to camouflage their activities through legal channels"—a strategy regularly implemented by Islamists wherever they are outnumbered, like in the U.S., prompting countermeasures such as Islamist Watch and the Legal Project. That Muslims are an otherwise peaceable minority group in Ethiopia, but in enclaves where they represent the majority, they attack their outnumbered Christian countrymen—giving them a tweaked version of Islam's three choices to infidels—suggests that Muslim aggression and passivity are very much rooted in numbers: the more Muslims, the more potential for "assertive" behavior. 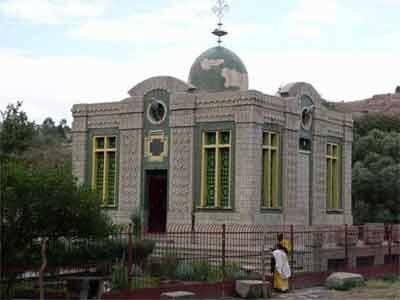 Ethiopia has some of the world's oldest churches, including St. Mary of Zion, which was originally built in the 4th century but nearly destroyed during a 16th century jihad waged by the Somali Ahmad ibn Ibrahim. This has lessons for the West, especially Europe, which in recent years has seen an unprecedented influx of Muslim immigrants, reaching some 53 million, a number expected to "nearly double by 2015, while the non-Muslim will shrink by 3.5%," due to higher Muslim birth rates. In short, it is a matter of time before Muslims account for significant numbers in Europe—perhaps not the majority, but, as the Ethiopian example establishes, a majority is not necessary for the winds of jihad to blow. Indeed, the story of Islam's entry into Ethiopia, one of the oldest Christian civilizations, is illustrative. Around 615, when the pagan Quraysh were persecuting Muhammad's outnumbered Muslim followers in Arabia, some fled to Ethiopia seeking sanctuary. The Christian king, or "Negus" of Ethiopia, welcomed and protected these Muslim fugitives, ignoring Quraysh demands to return them—and thus winning Muhammad's gratefulness. Today, 14 centuries later, when Islam has carved itself a solid niche in Ethiopia, accounting for 1/3 of the population, Muslim gratefulness has turned to something else—not least a warning to Western states.